The Indiana Farm Show will focus a great deal on new Ag technology and product innovation in Indiana farm equipment, seed genetics, precision agriculture, bio-science, robotics, sensors, big data, artificial intelligence, and more. A practical showcase of the latest technology and innovation that farmers can take home and put to work in their operations. 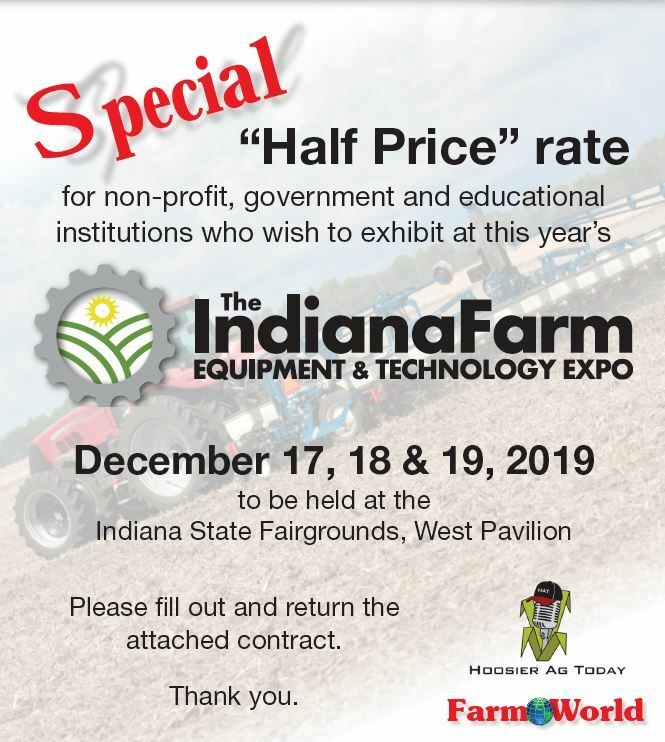 To reflect this, the name of the show has been changed to The Indiana Farm Equipment and Technology Expo. The show will be interactive, with daily live demonstrations of new products and technology as well as an expanded series of educational seminars. One tradition will not change, however, admission to the show is free. Seven Interstates and six U.S. Highways, the most in the nation, provide easy access from some of America’s richest farmlands to its 11th largest city. Route 69 from Michigan, Routes 31 and 65 from northern Indiana, Route 65 from Kentucky and Routes 70 and 74 from Ohio straight through to Illinois, all meet at Indianapolis. Free to the farmer and the trade featuring Long Line, Shore Line, Supply, Seeds, Chemicals, Livestock and Dairy Equipment, geared for the maximum buyer and media exposure. The response to our last show was excellent—over 325 exhibiting companies (see back cover) and an outstanding Farmer and dealer attendance that came to buy. Throughout the expo, free educational seminars will be hosted by Hoosier Ag Today. The seminars will be focused on new technology, marketing, farm forecasts, and agribusiness. List of speakers and dates will be posted soon.